Multi-award winning interior designer to the stars, Martyn Lawrence Bullard weaves together a touch of magic in every home he decorates. Revered by his A-list clientele for his eclectic style, savvy fashion sense and keen eye for luxury. 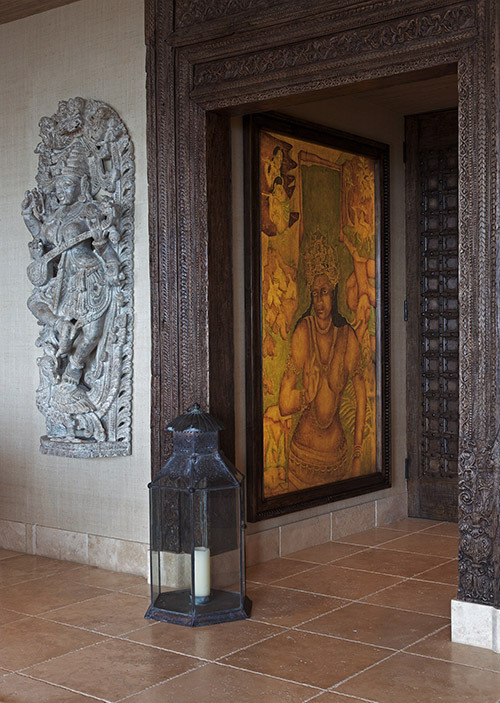 Architectural Digest has named him one of the world’s top 100 interior designers. In addition, Bullard has starred on Bravo’s hit TV show “Million Dollar Decorators” and the UK based reality design makeover show “Hollywood Me”. Bullard boasts a stunning line of fabrics inspired by his travels around the globe and he is presently working on a fashion and jewelry line, which is bound to be a success. Luxe Beat Magazine chats with Martyn about life, luxury and the little touches. You initially started out pursuing acting. What was the impetus that inspired the career shift towards design? Martyn Lawrence Bullard: My career shift towards design happened when the producer of a film I was in came to dinner at my home and loved it. He then asked me to help decorate their offices, which I did for fun and then many people started calling me and asking me to do it for them. I suddenly had a new career! Since you were a teen, you have had an eye for buying and selling antiques. Do you recollect one great find that really impressed you and why? MLB: I still have some of the treasures I collected from my early years, when I spent my weekends buying and selling antiques etc. These included Georgian tea caddies, small boxes of ivory, silver and stone inlay, old iron stone decorative plates, transfer-ware china and many other pieces that have travelled all over the world with me. Where do you derive much of your inspiration from when designing such exquisite interior spaces? Is it a certain country, place, or muse? MLB: My inspiration comes from all around me. Every day, I see, smell or touch something that will inspire me. Travel, however, is my biggest form of inspiration. A new country, cultures, colours, tastes; they all become the threads I weave my decorative tapestry from. It is the most important thing for me to see the world and experience all the beauty that each new culture has to offer. What Luxury items in your abode could you never live without? MLB: My must haves for the home are my small moments of comfort; fabulous cotton sheets are my everyday luxury; double stuffed down pillows for the bed; large Scottish cashmere throws to snuggle under on cold nights while watching a good movie; a great crisp sound system, preferably piped throughout the house, especially in the bathroom! I’m a huge advocate for natural, organic mattresses. Custom comfort in LA makes an amazing medium firm mattress that’s stuffed with organic cotton and wool — the perfect night’s rest, the ultimate luxury! It’s like sleeping on a cloud. I travel so much for work these days that I dream of nights at home blissfully snuggled up in my bed and cuddling my beautiful baby dog, Daisy, a soft coated wheaten terrier. You have a great knack for detail and incorporating a melting pot of styles. Where do you think that flare comes from? MLB: My personal style is certainly eclectic. I love so many styles from so many periods and find for myself the perfect interior blends together pieces from many centuries that have a common thread in color, form or mere beauty. I guide myself thinking of the words of the great Oscar Wilde, “All beautiful things belong to the same age”. For my clients, I don’t give them my style. Instead, I work with them to create their style, to extract their dream interior that will reflect their personality as well as coordinate with a beautiful, luxurious home. My approach to decorating a room is to first look at the architectural style and pay honor to that. Then, I try to understand the client’s needs and requirements from that space. With this information, I can plan out the furniture configurations and colour palettes that will serve the client and space best. 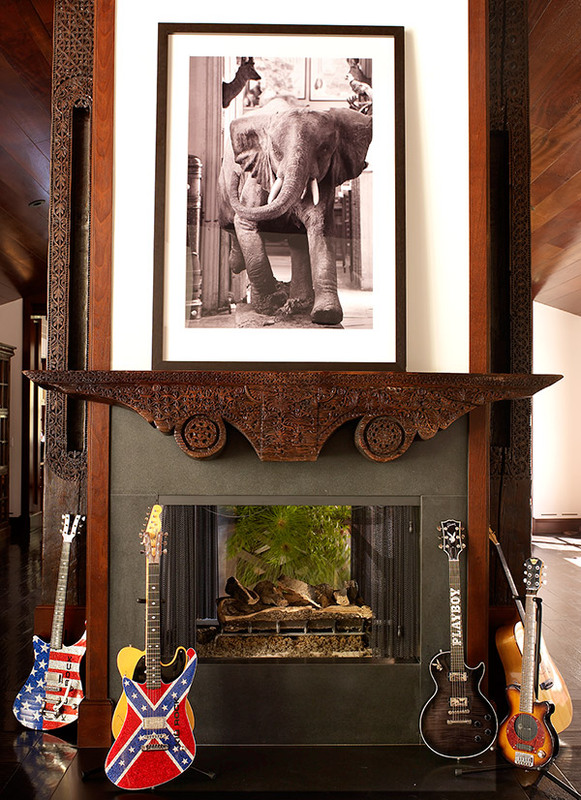 Kid Rock’s black soap stone fireplace surrounded by his collection of guitars. You work with a lot of A-list clients. Are they resistant to change initially? How do you get them to open up to fresh design ideas? MLB: Celebrities are just like the rest of us, except their personal lives become more animated and they really do need a private sanctuary to recover and rest in. They tend to want to live out their fantasies too and are usually more adventurous with their decorative ideas. It’s my job is to reel this back in, formulate the desired look and make their home into a beautiful sanctuary for them that meets all of their needs and decorative dreams. A tropical island or a villa tucked away in Tuscany? MLB: I love so many different architectural styles that it is really hard to pinpoint my ultimate dream home. I think if pushed, I would have to say a beautiful villa in Tuscany, designed by 16th century architect-extraordinaire Andrea Palladio, would do just fine! Kid Rocks’ custom “Harbour Island” bed draped in white muslin. It seems Martyn Lawrence Bullard is always working on exciting projects for well known celebrities. Most recently, he designed Cher’s Pied-à-Terre penthouse in West Hollywood. 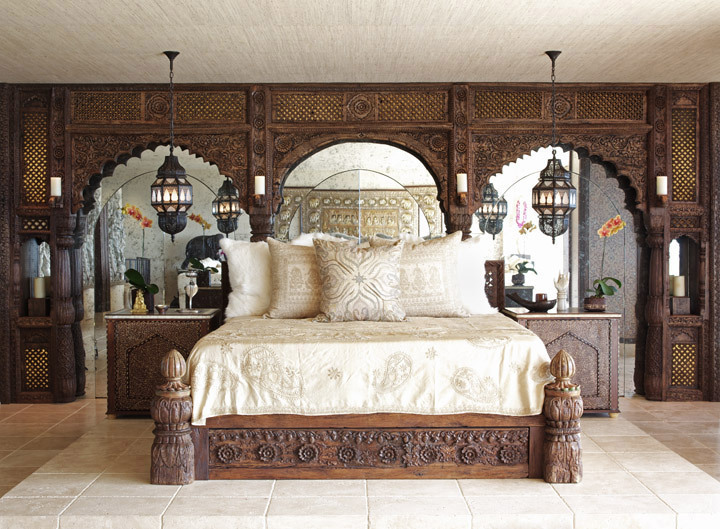 Inspired by an Indian fantasy and fit for a princess, Bullard filled rooms with exotic and magical touches from South East Asia, including a triple-arched entry way reclaimed from a Rajasthan palace. In addition, he recently designed Kid Rock’s Malibu digs. Rock was looking to create a true hidden oasis, and Martyn delivered a “Zen Rock n Roll” abode with a real tropical vibe that was filled with all the comforts of home. Learn more about Martyn at http://www.martynlawrencebullard.com.